Colour play fun… but in the kitchen? You are here: Home / Imagination / Colour play fun… but in the kitchen? Colour is everywhere! Grey days, rainbows, autumn leaves, impossibly blue skies, brilliant pink flowers, murky brown mud or an expanse of green lawn. My children and I have had great adventures exploring the concept of colour during our time outside. To be honest though, I’d never really thought about introducing lessons on colour into our kitchen. Which is why it was utterly delightful last night when my 7 year old made the realisation that her favourite colour (purple) was taking precedence in the evening meal. 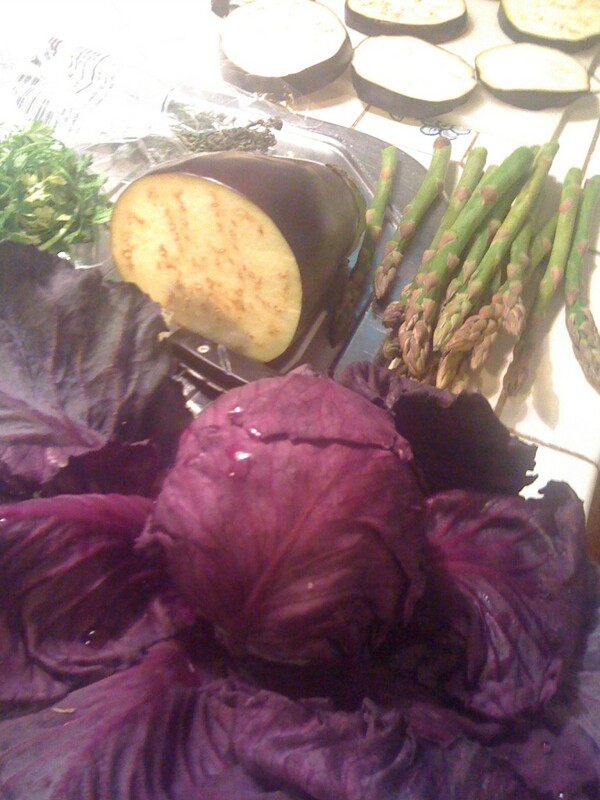 There was a shimmering deep purple eggplant. An incredibly beautiful home-grown cabbage. Spring asparagus, with a blush of purple at the tips. 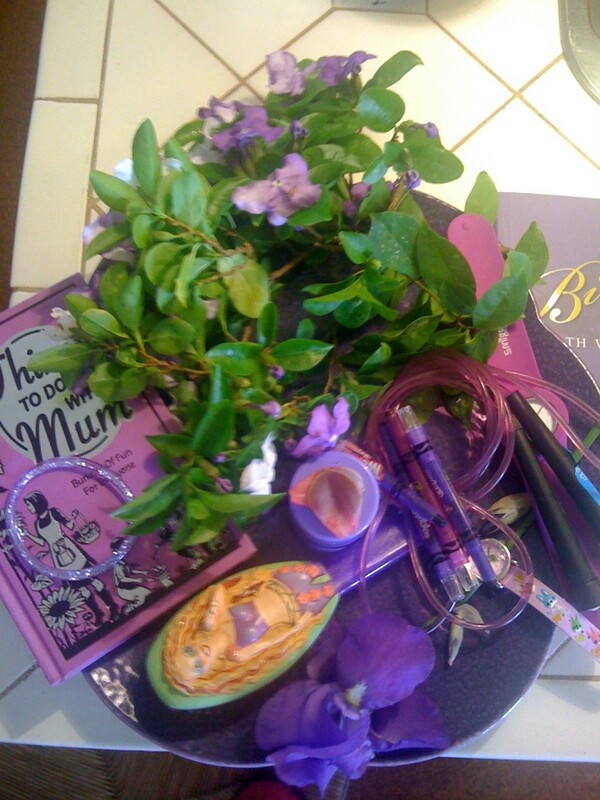 Squealing with delight, my daughter then raced about pulling together every hue of purple she could find in the house. It was quite the collection: A large purple platter, a beautiful Iris from the garden along with some sprigs of the pretty plant “Yesterday, Today, Tomorrow” (Brunfelsia grandiflora). A couple of books, pens and colouring pencils, a skipping rope, hairbrush, a watch, and on it went. She even reminded me of the picture of her friend on page 122 of my book, Small Fry Outdoors! We happily chatted together whilst preparing dinner about primary, secondary and tertiary colours and whether Indigo was blue or a deep shade of purple. It was great fun and needless to say, she ate every last scrap of the family meal. Oh, and the meal? Eggplant and haloumi stacks, grass-fed scotch fillet steak sitting atop blanched purple cabbage with spring asparagus on the side. A squeeze of lime, freshly cracked black pepper and a pinch of sea salt completed a beautiful, healthy meal. How wonderful. A panache of purple. Perfect!